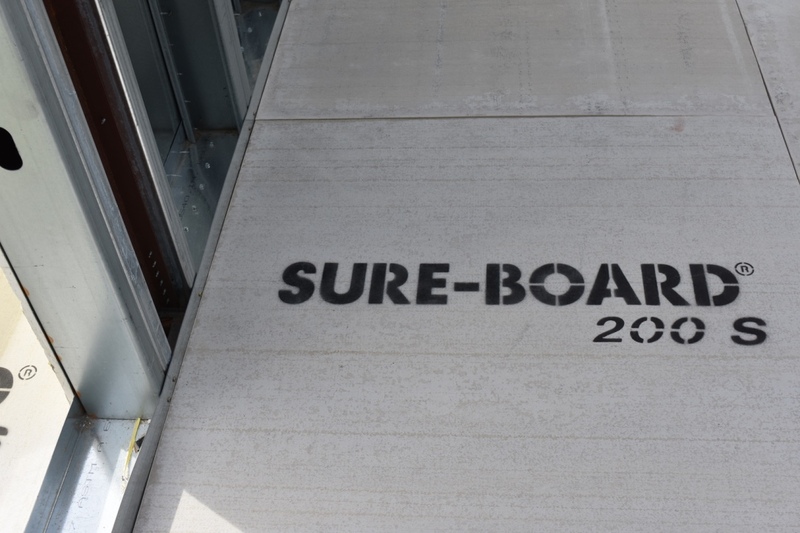 Sure-Board® is an innovative product designed to meet the demands of an ever-evolving construction industry. 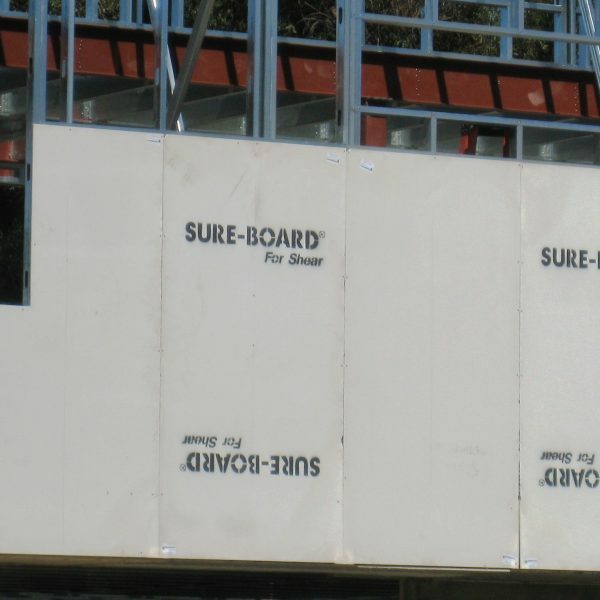 Sure-Board arose from demand for stronger and more dependable shear wall panels, making it an indispensable product for architects, engineers, and contractors across the nation. Sure-Board both satisfies and surpasses current building codes and continues adapting to match the needs of tomorrow, today. Readily available in varied assortments of laminate materials, Sure-Board stands up to the stressors of climate, geography, and exposure, furnishing ace products to meet your needs. 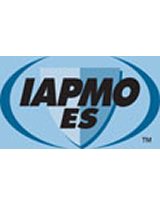 Sure-Board® Series 200 Structural Shear Panels are patented and approved by ICC, IAPMO, DSA and the City of Los Angeles. The Series 200 is manufactured with a single 22-gauge galvanized sheet of steel laminated to any manufactured version of gypsum panel with a water-based EVA adhesive to create and an incredibly strong shear panel that is 1 and 2-hour fire approved. Series 200W is also a structural shear panel with one dynamic difference; since 200W is laminated to 1/8″ MDF (medium density fiberboard) the attachment can be with nails or screws. This allows 200W to be attached to wood or steel framing members with exceptional results. 200W is used as a substrate shear panel and can be installed in the field or in a panelized process, saving even more time in the field. And as we all agree…time is money! Sure-Board® has a gypsum board facing that integrates with standard gypsum board for a smooth uninterrupted finish. Sure-Board requires no leveling and is ready for finishes. Sure-Board lays flat on the stud surface with no sagging, leaving no surface irregularities. When Sure-Board is used, there is no need for additional structural sheathing or tension strap braces, requiring costly and laborious pre and post-tensioning. 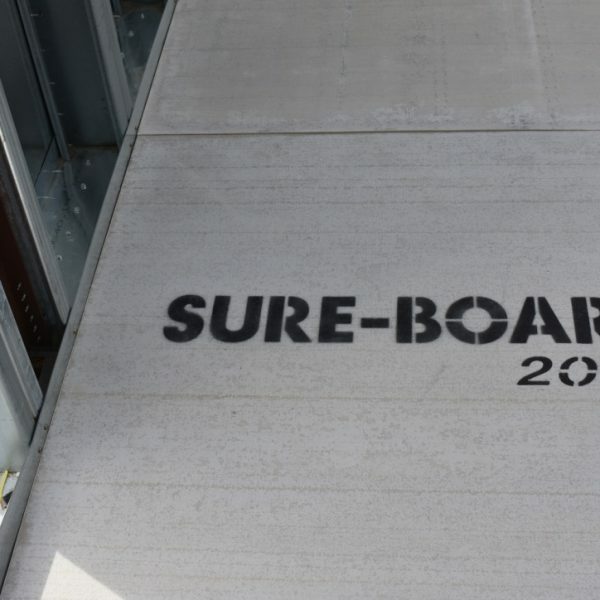 Sure-Board® Series 200B (“B” as in Blast and Ballistic) is a patented revolutionary product designed for today’s ever changing blast and ballistic construction needs. Developed out of necessity to provide a stronger, longer lasting and more reliable shear wall and blast/ballistic panel, Sure-Board is the best choice for engineers, architects, and contractors alike. 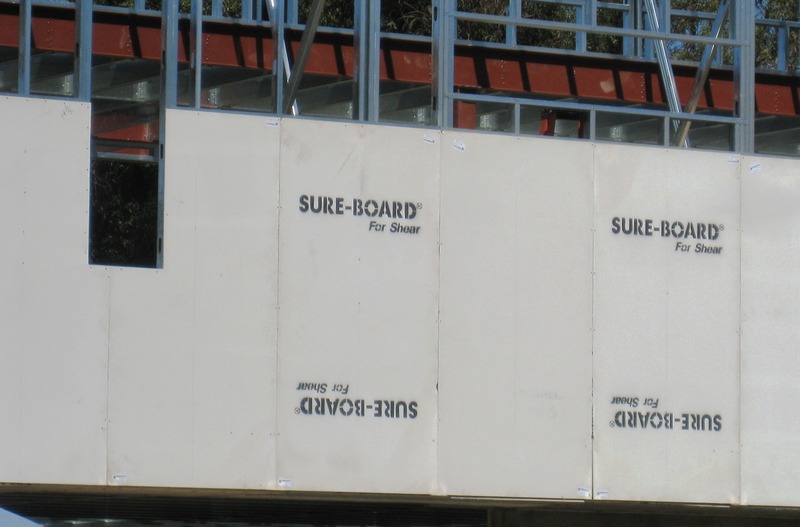 SureBoard® Series 200S is lightweight and easy to handle, easier to install than any of the other available non-combustible sheathing panels. The panel size is 48”x48” and the product utilizes 20 Gage galvanized sheet steel. 11/16” Fiber cement sheathing adhered to steel, and steel sheet extended 2″ on one edge for blocking. Sure-Board® Series 200W Increased load values reduce total length of shear wall required. Installed on wood/steel framed shear walls, the patented 1/8” profile eliminates shimming reducing the labor required.